Walmart’s fiscal year is completely different from a calendar year, and even differs from year to year. This can make planning, especially for holiday-specific events, a bit of a challenge. Thankfully, the fiscal calendar is well-defined. The Walmart fiscal calendar is defined in terms of week numbers. The Walmart week begins on Saturday and runs through Friday midnight. For this reason, the beginning of the Walmart fiscal year falls on a different calendar day each year. The beginning of the Walmart fiscal year is defined as “the week containing February 1st”. In other words, if February first falls on a Tuesday, the Walmart fiscal year (i.e. Week 1) began that previous Saturday. This means that certain holidays can occur in different Walmart weeks year over year, and in some cases a holiday can occur in a different Walmart month! Just as the Walmart weeks are rigid (Saturday – Friday), so are the Walmart months. The Walmart month is based on the Walmart week structure, NOT a calendar month. For example, Walmart’s month of February is Weeks 1-4, not February 1-28. This is why it is important to know which Walmart month a certain holiday falls in … reporting of year over year sales can show a dramatic difference if a holiday occurs in a different month each year. The Walmart quarter is just as rigid, also being defined in terms of Walmart’s week numbers. Each quarter consists of 3 months, and the months follow a 4-5-4 format. In other words, the first month of every quarter has 4 weeks, then 5 weeks for the second month, and finally 4 weeks in the third month. Now, What About That 53rd Week? You will notice that in some years, the Walmart fiscal calendar has a 53rd week. What’s up with that? Well, since earth’s year isn’t exactly 7 days x 52 weeks, there is a bit “left over” at the end of each calendar year (think Leap Year!). Similar to Leap Year, Walmart adds a 53rd week every 4 years in order to “catch up”. This can all be a bit confusing, but you really don’t need to concern yourself with it, especially from a reporting perspective. Retail Link adjusts their reporting based on this calendar, so you won’t have to do anything crazy in these 53-week years. 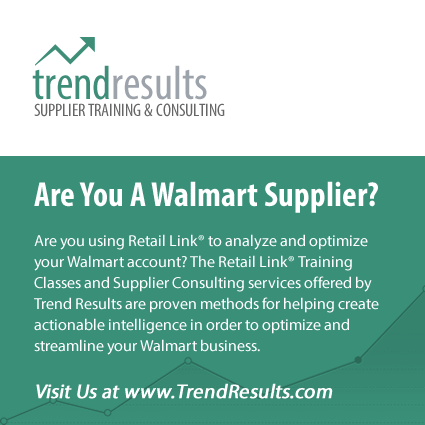 In fact, the easiest way to keep all of this straight is to Download the 2019-2020 Walmart Fiscal Calendar, which maps all of this data, providing you with a calendar year lined up with Walmart’s Fiscal Calendar format. Previous Article Walmart Is A “Technology Company”? Don’t 53-week years happen a bit more often than once every 7 years? I would expect once every 5 or 6 years. Is there a list of such years? I could compute them using the statement that Week 1 always contains the 1st of February, but I want to be sure that I understand correctly. You are correct! It roughly follows leap year. 7 years was a typo, thanks for catching it! The article currently states a 53 week Walmart year will happen every 4 years; I believe a 53 week Walmart year will happen every 5 or 6 years.